Most of the successful people I know made massive leaps toward more fulfilling futures despite their doubts, fears, and anxieties. I know I did. When I started my business I had no idea whether anybody would even come to me for guidance—let alone pay me. I was a single mum struggling to pay my mortgage. I didn’t have a safety net. When I look back on my life I’m amazed at how far I’ve come. I built several successful businesses, uprooted my life and moved to the end of New Zealand and I’ve reinvented my career as an author and intuitive coach. But guess what? Everything that I do, I still do scared. What gave me the courage and confidence to change? An obsessive desire to follow my passion to prosperity. Does this resonate with you? One of the simplest ways to boost your courage and confidence is to read a book that guides and empowers you to make changes. It worked for me and it will work for you. Talking with a career coach made a massive change too. Suddenly I had somebody on my side, cheerleading me along. Several years ago when I was in New York I stumbled on a book that was to change my life—Psychic Living: Tap into Your Psychic Potential, by Andrei Ridgeway. “In this technological day and age filled with busywork,” Ridgeway writes, “many of us neglect our psychic potential. Our instincts are repressed and our inner voices buried. 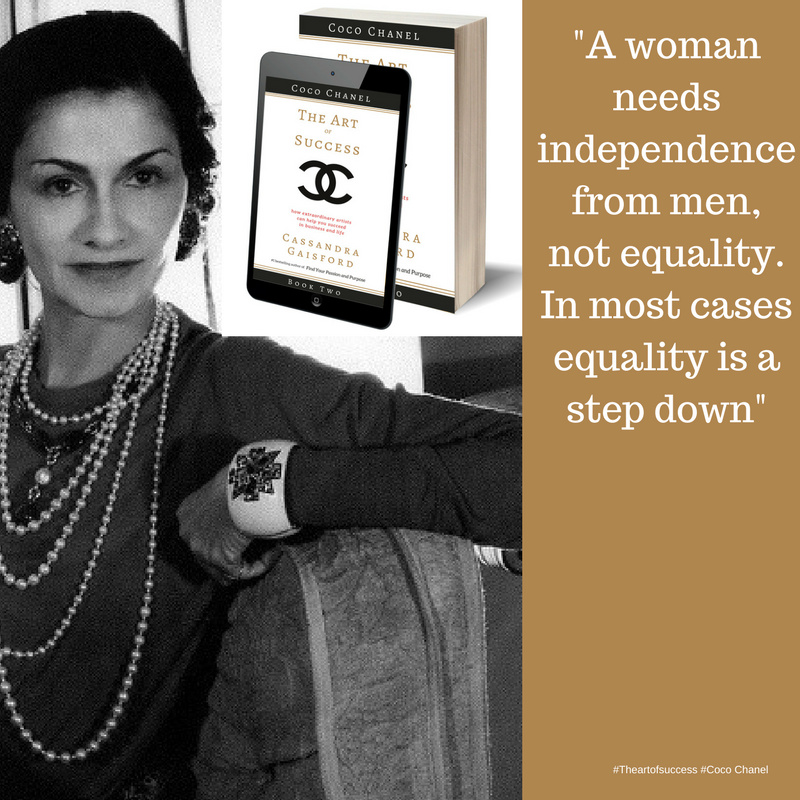 Some people claim Coco Chanel was intuitive to the point of being psychic. She could see into the future, spot needs for which there would later be demand, and had a brilliant knack for creating the right product at the right time. How could you awaken or strengthen your psychic potential? Engage all your senses so you can feel, taste, touch, smell and hear your future. Or does your mindset need a boost? I know my mine does. I’ve been working like a trojan this year. As I write to you now, I’m excited to share that n just a few hours I’ll be boarding a plane and flying to Bali, Indonesia with my mum. For two glorious weeks, we’ll be doing girl bonding. I can’t wait to tell you all about my travels to this magical, mystical island. “While my book may be complete and receiving more traction than I could possibly have hoped for, I now find myself worrying about my ability to do the promotion and ‘selling’ of it that I’m led to believe is expected of me. Self-Doubt. This is more scary to me than having the book read and I will use your inspiration to teach myself the confidence I am going to have to find and deliver on in the coming months. Your book is brilliant work,” wrote author Heather, whose soon-to-be-released book The Tattooist of Auschwitz wrote, after reading my book, The Prosperous Author: How to Make a Living With Your Writing, Book One: Developing A Millionaire Mindset. I started reading this when you first sent it to me, got sidetracked quite early on, too much going on over here both with family and publishers. I went back to it on Wednesday in the right frame of mind and couldn’t put it down. Not only could I not stop reading but when I had finished it I went back to page 1 and read a second time. I just knew I’d only fully absorbed 50% of your wonderful advice and wanted it all. My son and daughter-in-law, plus 2 little ones were around today and at one point my daughter-in-law was lamenting the pressures on her both at work and as a mother. She is a very senior economist for the state government working outrageous hours and with immense pressure on her as she manages the State health budget, the biggest in the government. I gave her my ipad and told her to flick through your manuscript and read what she thought might help her. She disappeared into another room for an hour and came back thanking me and saying she felt empowered to make changes, not for financial reasons, but to get her life back on track and determining what is really important for her and her family not her employer. Part of my pressure has been getting my manuscript, again, into a publishing mode. Dymocks, the largest bookstore franchise in Aust are having their annual conference in Sydney in 2 weeks time and they asked if they could showcase my book. This put the pressure on to get an ARC ready and to the printers. This happened only on Friday. Attached the ARC cover FYI. While my book may be complete and receiving more traction than I could possibly have hoped for, I now find myself worrying about my ability to do the promotion and ‘selling’ of it that I’m lead to believe is expected of me. Self-Doubt. This is more scary to me than having the book read and I will use your inspiration to teach myself the confidence I am going to have to find and deliver on in the coming months. These comments and those below in response to my questionnaire have been incredibly fulfilling to receive, but they are also a reminder of how books can literally change lives—one word at a time. How you brilliantly tied together your opening quote on each chapter with your own thoughts, expanding on the statement in a fun and totally digestible manner. Would you be willing to write a short comment that I can use to help market The Prosperous Author Just one or two sentences—or more. Cassandra has crafted a book that is not only easy to read, digest, provoke self-evaluation and encouragement, but is entertaining and enjoyable to read on every level, in every chapter. You just know she has ‘walked a mile in your shoes’ and is willing to share her experiences and invites you to ‘walk a mile in hers.’ She motivates and inspires while challenging the reader in a gentle way to seek the best in themselves and go for it. Love your passion Cassandra, you have my admiration for what you have achieved and for what you encourage others to achieve. Do you have sense of what is at the heart of The Prosperous Author How does this feel, as a reader? Could this be improved? What suggestions would you like to offer? What was your favorite chapter? Could this be improved? What suggestions would you like to offer? Your Health is your Wealth. Maybe because I’m at the older end of the spectrum I took this chapter on board and realized I need to do more for not only my physical health but mental health. Did I miss anything? Was there a topic that you would have liked included? What suggestions would you like to offer? Are they any places where I went on too long? Was anything boring? Repetitive? Short, sharp, succinct and to the point. Were any sections too short? Maybe the one on Allow no Doubt. Attitude, attitude, attitude plays a huge part in how I approach everything in life, my writing in particular.